Hungry PGRs descended upon the Gilchrist last week as PGR & Postdoc Bake Off returned to UofG, once again trying to establish just who has the most delicious research on campus. This year’s competition, hosted by the Gilchrist’s regular pub quiz host Kenny Anderson, was a true cake extravaganza, as our bakers presented some show-stopping sponges inspired by their research. 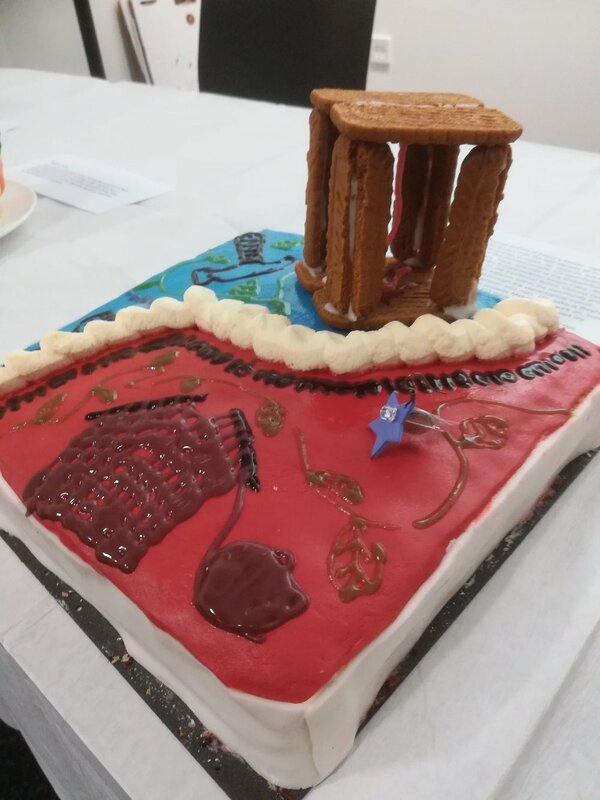 Last year’s bakers set the bar high with their fondant decorations and icing skills, but the 2018 certainly competitors rose to the challenge- in some instances, quite literally as former PGR Blogger Ellie presented a cake featuring LED lighting and a biscuit structure! Right: Elisabeth Loose’s Maker cake- featuring tower and lighting! After much deliberation- and plenty of extra slices- the runner up prize was awarded to Rosemary Brown for her sumptuous cholesterol monitoring research served up in the form of chocolate cake and biscuits. The People’s Choice Award- with votes provided by a rather content and cake-filled audience- went to Natasha Turner, who baked a lemon cake, decorated to demonstrate the different factors which affect bacteria. Natasha assured us that no bacteria from her research was included in her ingredients! Natasha with her bacteria-inspired cake, and Rosemary’s cardiovascular chocolate masterpiece. Finally, the evening’s Star Baker prize was awarded to Mario González Jiménez for his gin and tonic cake, inspired by the traditional treatment for malaria, and topped with a cucumber and physalis neurological network. This was a recipe that both the judges and audience declared they wanted to steal and replicate for themselves, and good news- you don’t need to be a chemist to make this one yourselves. Mario has kindly supplied the recipe for us below. 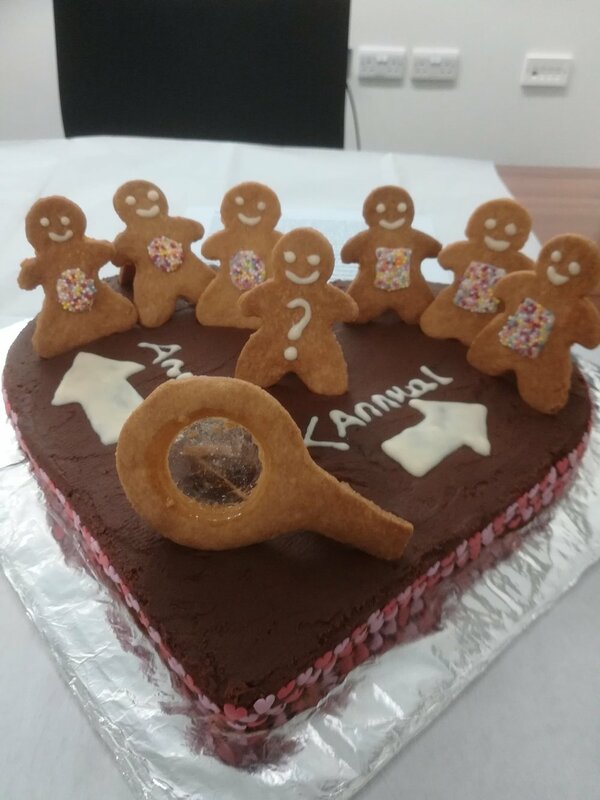 Think that your research lends itself to cake, biscuit or pastry form? The Bake Off will return next year, so there’s plenty of time to get practicing those show stoppers! In the meantime, enjoy Mario’s recipe, and don’t forget to let us know how you get on! Mario’s delicious gin and tonic cake. You can recreate this cake at home using Mario’s recipe below! Heat the oven to 180C/160C fan/gas mark 4. Greese and line 2 x 20cm cake tin. Beat together the butter and 200g of the sugar until pale and fluffy, for around 5 mins. Add the eggs one by one, making sure they are fully incorporated before adding the next. If the mixture looks like it might split, add a tablespoon of your flour, then fold in the rest of the flour. Mix the natural yogurt with the juice of one of the limes and 50ml of the gin, then add this to the cake mixture to make a thick and silky mixture. Add the baking powder. Split between the two tins. Bake for 35 mins until a skewer comes out clean. Whilst the cakes are baking, make syrup. Put the remaining sugar, tonic water, and juice of one lime into a saucepan over medium heat. Once the sugar has dissolved, bring to the boil and cook for 5-7 mins, until it’s a thick syrup. Cool for 5 mins, strain then pour in the remaining gin and set aside. Once the cakes are out of the oven, allow to cool for 5 mins, then prick all over with a skewer, then liberally spoon the syrup mix over the cake. Allow to cool completely in the tin. To make the buttercream, beat the butter until soft, then add gradually add the icing sugar. Once fully incorporated, add the milk and the zest of the limes. Decorate with cucumber and physalis.